I stayed up making some Norwegian Easter cookies last night and am I ever glad I did, they're pretty darn tasty! Pam over at Gingerbread Snowflakes has been doing a ton of Easter posts, and these were one of them. The ingredients are pretty much like a shortbread but brushed with egg and topped with sugar. Unfortunately, I did not have any pearl sugar on hand so I just used some plain sugar and a little colored sugar too. 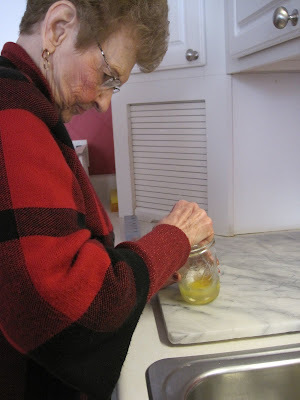 Mix together sugar and butter, add 1 egg (only 1 of the 2!). Sift the flour and baking powder together and slowly add to the mixture. You're supposed to refrigerate them...but I didn't. Shape dough into little balls and make indentations with your thumbs. Brush with the 2nd beaten egg and sprinkle sugar on top. Bake at 350 degrees for 12 - 15 minutes. Egg coffee?? Yes, egg coffee. I don't know the history behind this crazy Swedish concoction but it's delicious, trust me. 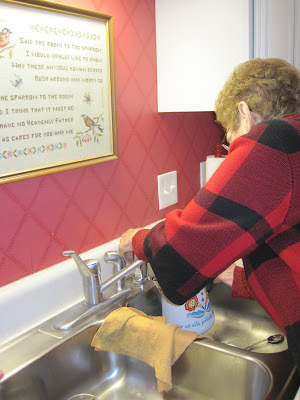 My grandma told me about this back when I was in high school and we made it together one afternoon. Then when I was over having a scrabble tournament with her yesterday, we made it again. It's so simple and actually makes one great cup of coffee. This is especially good if you don't own a coffee pot or are out of filters (which has happened to me one too many times). 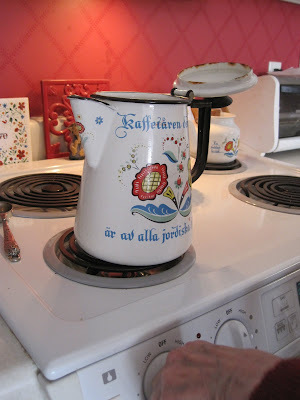 Ok. First, fill up your Swedish coffee pot (or saucepan) with approximately 6 cups of water (or however many cups of coffee you will be drinking). 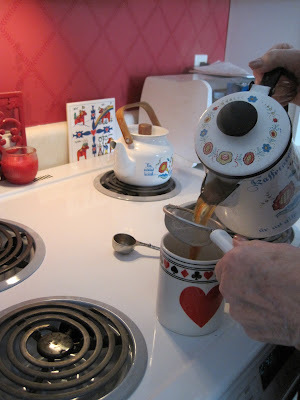 Set your pot full of water on the stove to boil. Next, crack the egg in small bowl or glass, shells included. Then add a little water, about 2 teaspoons or so. 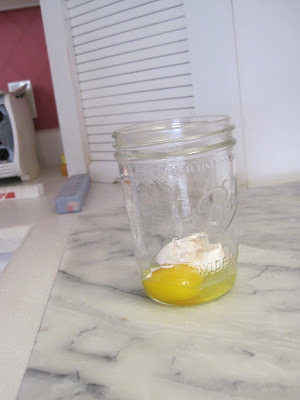 Stir together with the egg until it's completely mixed. 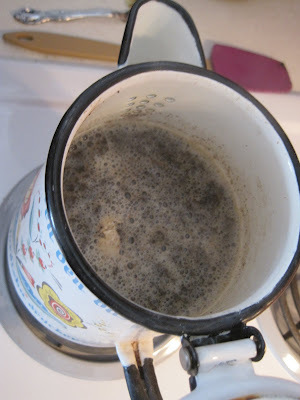 Put your coffee grounds in a bowl (about 1 Tbl of coffee grounds for 1 cup of coffee, more or less depending of your strength preference) and pour some, not all, of the egg mixture over the grounds. Mix together until all the coffee grounds are wet and "feel right" (direct quote from my Grandma). 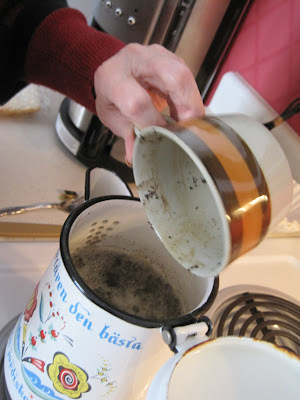 When it reaches a boil, dump in your grounds/egg mixture. Turn off the heat and stir vigorously. Let sit for 4-6 minutes. After boiling, the egg mixture should sink to the bottom of the pan with the grounds after a few minutes. If not, add a few teaspoons ice cold water. Below you can see the clumps still floating, we added 2 tablespoons cold water. Strain your first cup through a coffee strainer to ensure the grounds are at the bottom. No grounds were found - success! 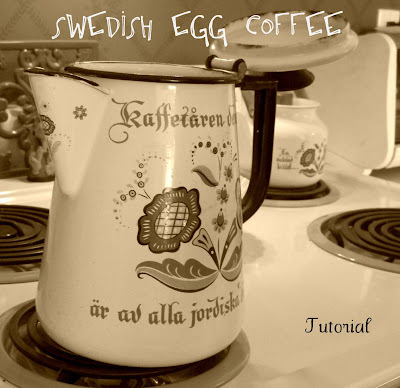 Fika (Swedish loosely translated as "coffee break") it up! 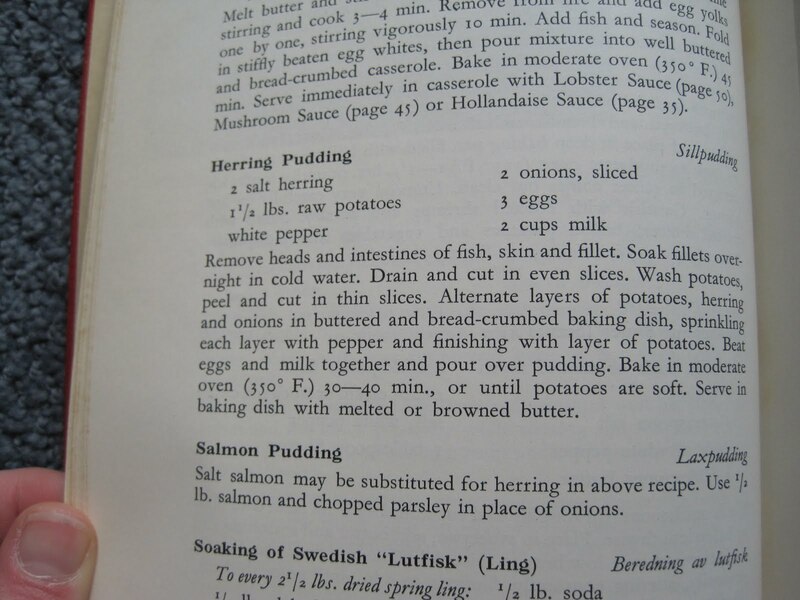 Yes, it's exactly what you think it is - a 1950s cookbook of all Swedish recipes. 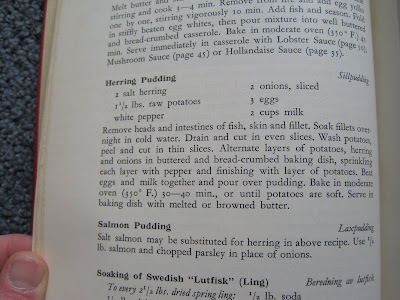 Complete with pickled herring recipes galore. What more could this girl want? !